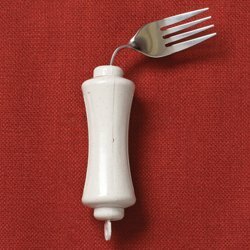 Utensils have a twist in the shaft that allows them to be easily hand bent to either side at any angle For people with upper extremity weakness or reduced range of motion. These stainless steel utensils feature built-up handles for people with arthritis, weak grasps or other hand limitations. Their contoured shape makes them easier to hold and use. Top rack dishwasher safe. If you have any questions about this product by Medifone, contact us by completing and submitting the form below. If you are looking for a specif part number, please include it with your message. Kinsman Enterprises, Inc. (n) Bowl Weighted 12 Oz.